1:50 Another great photo of Tassie. Today - Let your smile be your sunshine! Wonder if Rage and I will bump into each other tomorrow - (and not on this site)? What a beautiful photo! Would love to see the area in person! I have been clearing out my 'inbox'. Wow! Lots of memories there! Thanks for the friendships on this site everyone! Hmmm, Shiela - you might, but how would you know it was he??? Cheers to all who've arrived far earlier than I, and now a good day to those who have left to make an appearance! 1.35. Round and round the rugged rocks the ragged rascal ran. Joyce, that is a problem!!! from the Emerald Isle. Little rain this morning then an overcast day with snippets of sunshine. Visited the Arigna Mining Experience, an underground mining tour that was fun. Apologies Joyce, I don't know what a Joice is but I'm sure it must be nice. Lovely coastal scene today! Nice photo , Wendy. Morning all, great photo ,Wendy. Fond memories of a boat trip from there that took us into caves along that coast to Port Arthur. Good mAEn, good people. I've been traveling on business a few days to get home to a long list of things to do. I'll finally be able to get out to vote and buy a loaf of bread and a gallon of milk in a few minutes. This will be Skye's first time voting. She was very conscientiously researching candidates before I got started on doing so. We ending up deciding on the same candidates, which was heartening for me, but the bigger thrill was to hear how penetrating her evaluation of different candidates was. Good mature reasoning and discernment for an 18 year old. Plus some fun discussion between us. Also, my oldest daughter (a/k/a Starr) is a candidate in a neighborhood association election. Small potatoes compared to most candidates running for positions, but it's a position she has a vision for. She has a strong sense of civics and community plus experience serving on a township committee. She's ready to step up. I was voter number 7XX. Not a very large precinct but consistently a greater than average voter turnout compared to many communities. I love primary elections. It's when I come closest to picking a dream team. everyone! Beautiful winter's day here in Brissie! My internet connection has been down all day. At first I thought it was due to us being connected to the NBN but it turned out to be just a common or garden outage by Telstra, our usual ISP. There is a story linked to the pictur3e of Eaglehawk Neck. 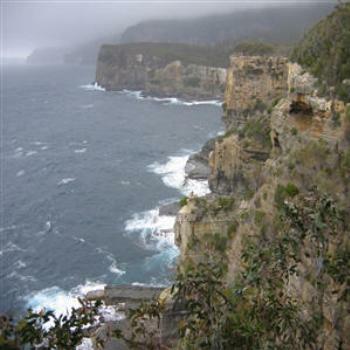 It is a narrow strip of land linking the Tasman Peninsula to the rest of Tasmania. Towards the southern end of the Peninsula is Port Arthur a really tough prison for the worst convicts. Naturally they tried to escape, but the only way off the Peninsula (apart from by boat) was by Eaglehawk Neck. So the authorities posted a detachment of soldiers to prevent. They also chained a number of vicious dogs together as a further preventative measure and told the convicts that the waters on either sides of the Neck was full of sharks. How effective it was I do not know. My paternal grandfather's brother (both were members of the 40th Somerset Regiment) was stationed there for some time. I shouldn't let turning the page occur without noting it.